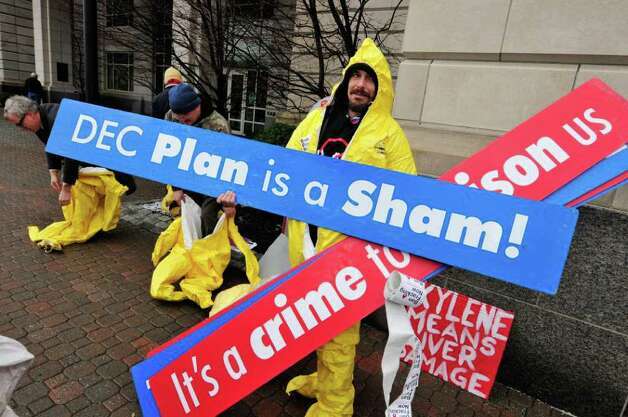 Just when we thought we’d seen it all from anti-fracking groups — hazmat suits, gas masks, extreme outbursts at public meetings – it gets even more interesting. In a press release sent out late last week, Citizens Advocating a Clean Healthy Environment (CACHE) in conjunction with the Community Environmental Legal Defense Fund (CELDF) actually filed a motion to intervene in a lawsuit regarding a Pennsylvania injection well on behalf of the ecosystem. “Today, an ecosystem in the United States filed a motion to intervene in a federal lawsuit to defend its own rights to exist and flourish. Rights of the Crystal Spring Ecosystem were secured in law by Highland Township in Elk County, PA, in January 2013. The Highland Township Supervisors enacted the Community Bill of Rights ordinance, establishing the rights of human and natural communities to water and a healthy environment – including the rights of ecosystems to exist and flourish – and banning frack wastewater injection wells as a violation of those rights. It’s yet another stunt in a long list of attempts by CELDF to, as Ohio Secretary of State Husted put it, “waste taxpayer’s time and money.” This time the victims are located in Highland Township, Pa.
And, in order to accomplish this they’ve taken the “right to govern” and packaged it into a “Community Bill of Rights” that includes extreme anti-development language that prohibits oil and gas development. It also goes after a host of other targets such as agriculture, mining, industrial wind production, retail chains, corporate operations of all shapes and sizes, and even major economic development projects. They even have a “Food Bill of Rights” campaign. So what would actually happen if the “ecosystem” were to “win” in one of these lawsuits? Just think about that for a moment. What happens when a farmer wants to build a new barn that involves removing some trees on the property? He might not be able to because that action removes the “right” of the ecosystem to flourish. What if a neighbor decides they don’t like another neighbor mowing their grass? It may sound extreme, but once this goes through it could stand up in court because the action removes the “right” of the ecosystem to flourish. If the ecosystem becomes recognized as a legal body able to file suits, as CELDF desires, the rights of property and business owners go to the wayside. Nature will own your property, not you. And the precedent is now being set by an organization peddling illegal local bans as a guise to shut down businesses across the country at the expense of the taxpayers.